A couple of other minor labels when you are having bits and pieces remade. 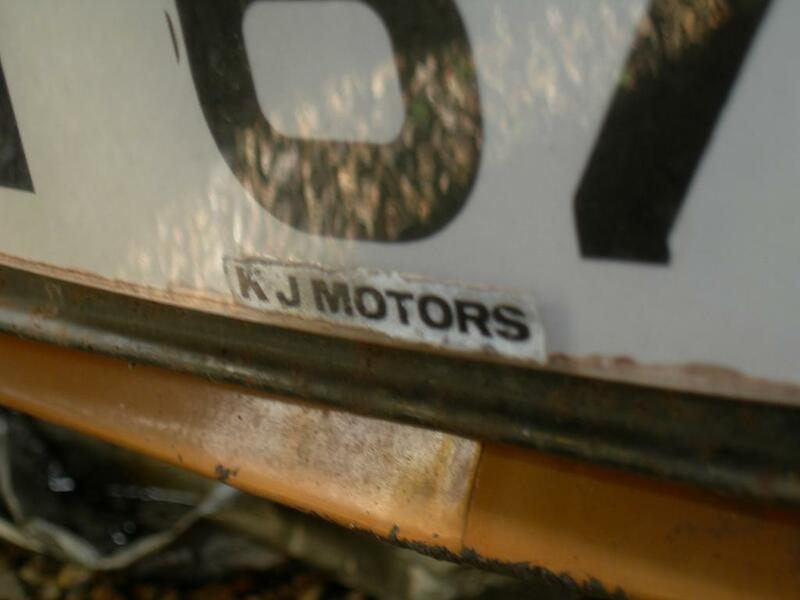 Original Magraw/KJ Motors front number plate and fitting on 083. 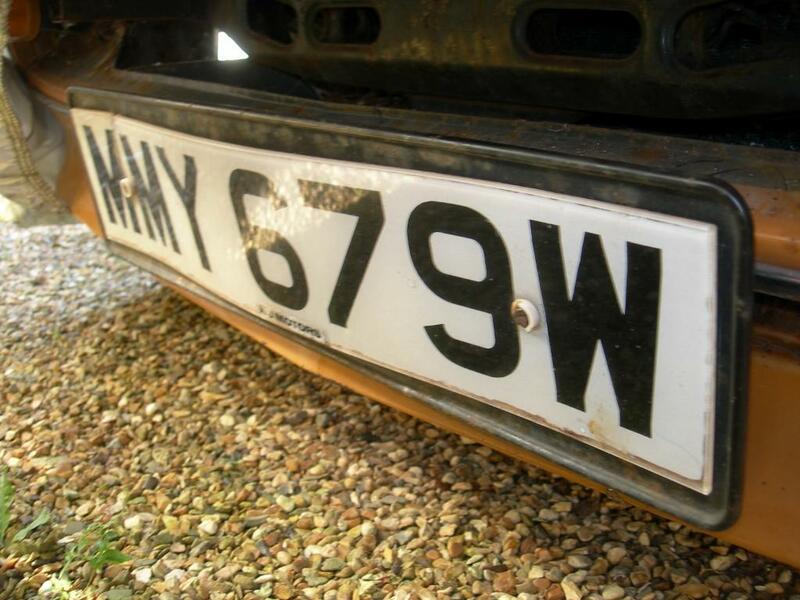 They used the original rear below-bumper backing plate, rather than discarding it when the rear plate was relocated above the bumper. You may already have these if the wheels have never been repainted. Clear label backing curved to match wheel rim. Can you get a close up, front on shot so I can either go on a font hunt or convert the image in photoshop to a scaleable item for printing ? I haven't got a picture of a rear screen sticker, I seem to remember them being black with a sort of light gold lettering. 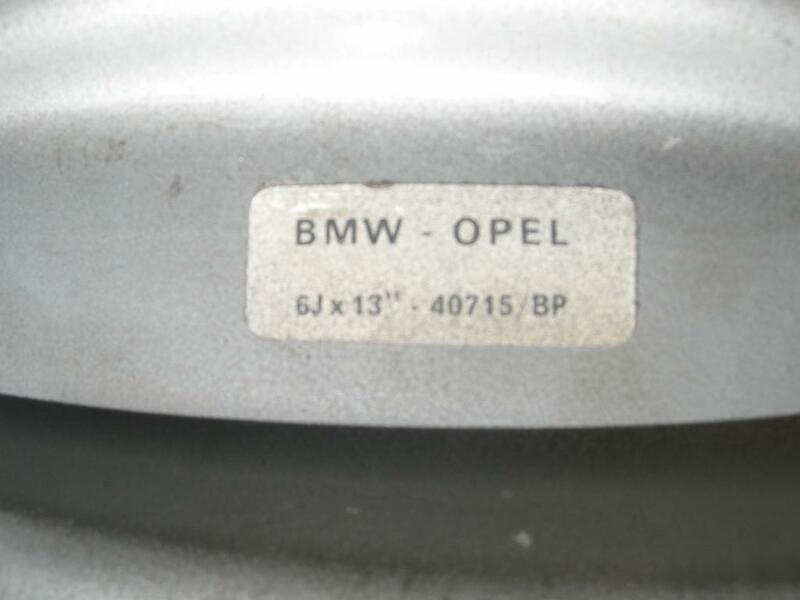 My rim labels had been overpainted, you can get them from this ebay supplier , I did ask them about a decal for the centre caps but they were reluctant to make some due to the curve, they can be sourced elsewhere but are around €100 for a set, my wheel nuts still have traces of light blue paint in the "M", pretty easy to get a match. I don't remember seeing any with the Rostyle centre caps with an "M" in like the brochure car, and it hasn't got them on it now so I suspect that was just a mockup for the photos. I'm currently struggling to find someone to strip my wheels for repainting, I did one myself using paint stripper but it takes ages, finding someone here in the are endo of Ireland that I feel comfortable with old magnesium is proving to be a problem, there's someone in Limerick that has experience of stripping it, but is quoting €75 a wheel just to strip so they'll be waiting until next year, the inside label is easy enough to replicate, my spare still has it, I'm assuming the other 4 are still there. Yes, will do. May take the plate off to get a better picture. 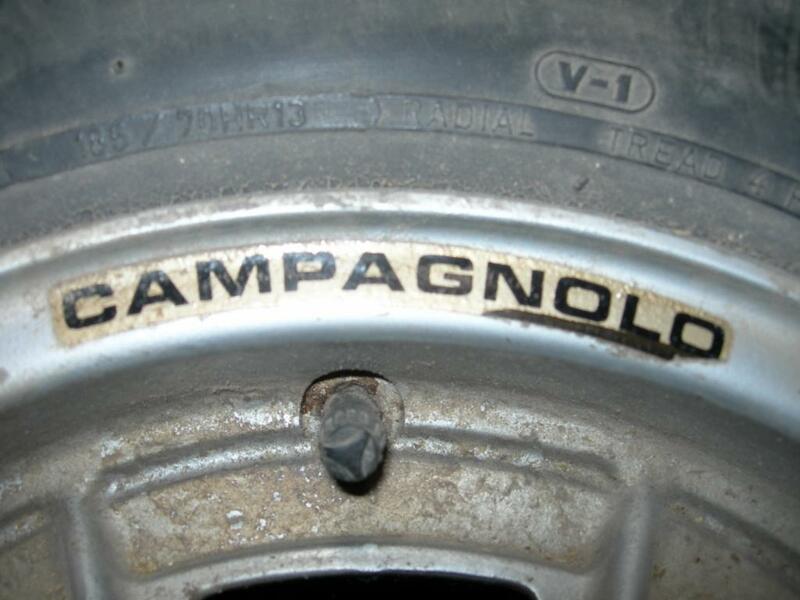 Thanks for the Campagnolo decal link . Probably best to take care with these wheels and find someone who knows what they are doing. The original paint finish is quite robust but once damaged the magnesium can corrode and pit readily. Best to stay away from too heavy abrasive blasting - anything with steel or iron embeds in the surface and makes corrosion worse. Glass bead could be better if not too coarse, maybe something less harsh like walnut shells or soda. Hopefully you can find someone with the right experience. I expect they where chemically treated when first manufactured with a chromate or phosphate process before the paint finish was applied. Epoxy powder-coat is probably the way to go for the finish. No rear screen sticker on my car unfortunately . The only other thing I can think of for the rear screen is the foam protection mat. Made from about 10mm thick grey foam, rectangular in shape and about the width of the rear window. It has the 'Centaur' logo about 300mm long stencilled in black across the middle. I was looking for the original hood operation handbook recently (if you can call a couple of pieces of paper stapled together a handbook) - stashed away so securely with the Cavalier owners handbook I can't find it at the moment. Hopefully it will turn up... . 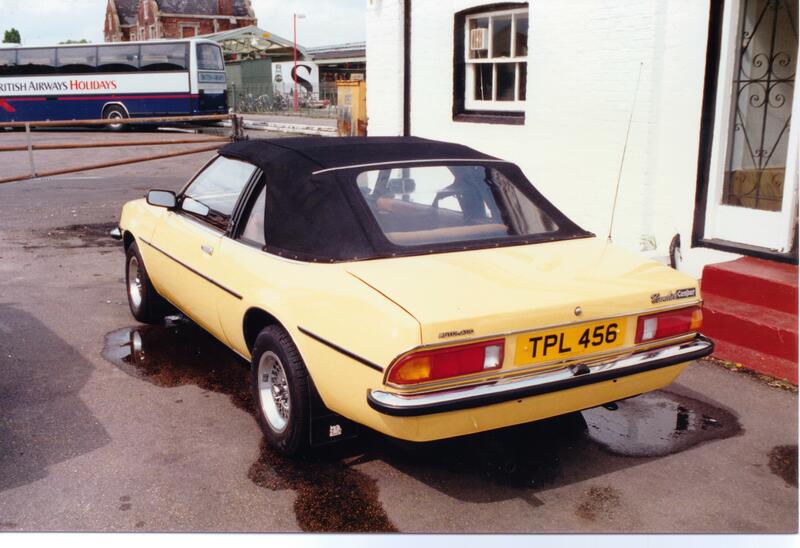 Finally sorted through the festoons of pictures received from the Crayford Convertible Club. Very interesting, have been following this thread and learned a lot. Thanks for sharing your finding. Would make a great article for the club mag. I'm certainly learning a lot as well, little snippets of info from here and there (loads from KAA), certainly the being send a part of the dashboard sticker has meant me having to brush up on my photoshop skills as the fonts used are not around in a usable form, and other things like the numbering system and how that kinda questions the 100+ made, something I'm still yet to find anyone who can verify it. 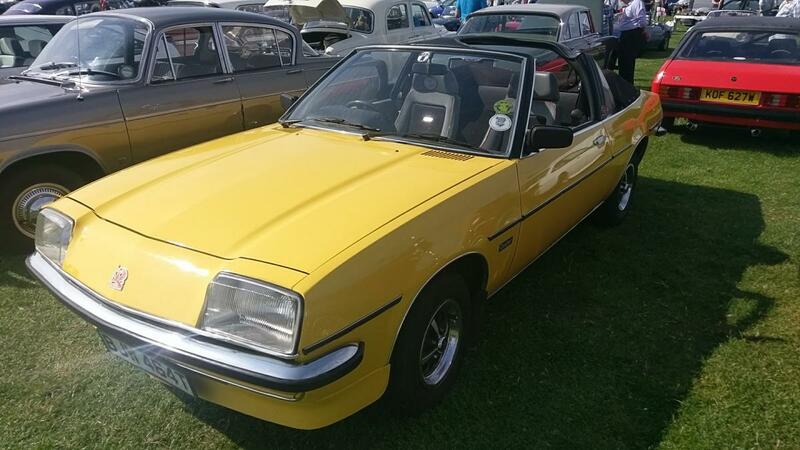 I know very little about the original design, why the Cavalier Coupe was chosen over any other car, mostly because Crayfords did mostly Ford based conversions. Now I've got what looks like a definitive list I'll start on the history side, the KJ side of it is going to be easy enough as I'm still in contact with some involved, the Crayford side and the Mumford side are going to be more difficult, thankfully there's still some around from Crayfords, Mumfords on the other hand may never be known. 2 unknowns have cropped up in the load of pictures sent by Crayfords, TPL456 and one that's a side shot so no red, but distinctive decals added. It is incomplete awaiting the tender ministrations of the body shop. 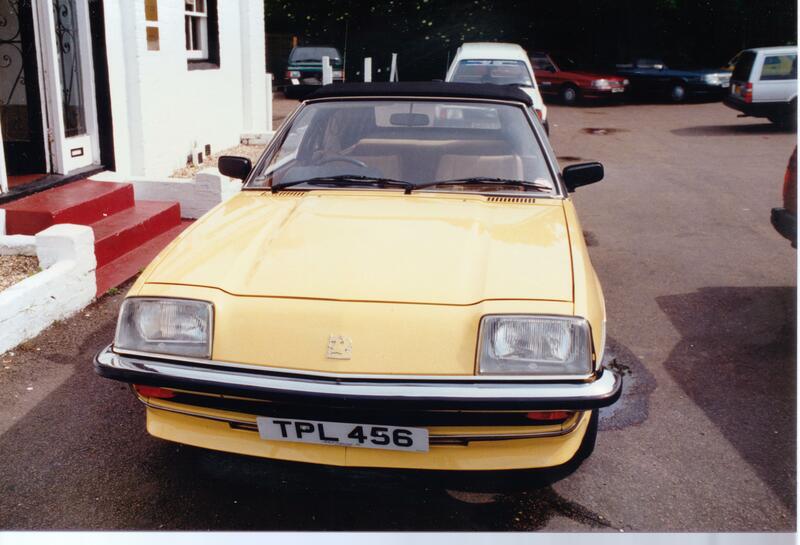 Now the bad news, its now a 2.4 on injection with a 5spd and is/will be MG Trophy Yellow. I've not got a commission number for yours, I'm hoping once I can find a way to decode the chassis numbers I'll be able to write a little script that fills in the blanks as going by registration date the commission numbers aren't sequential. 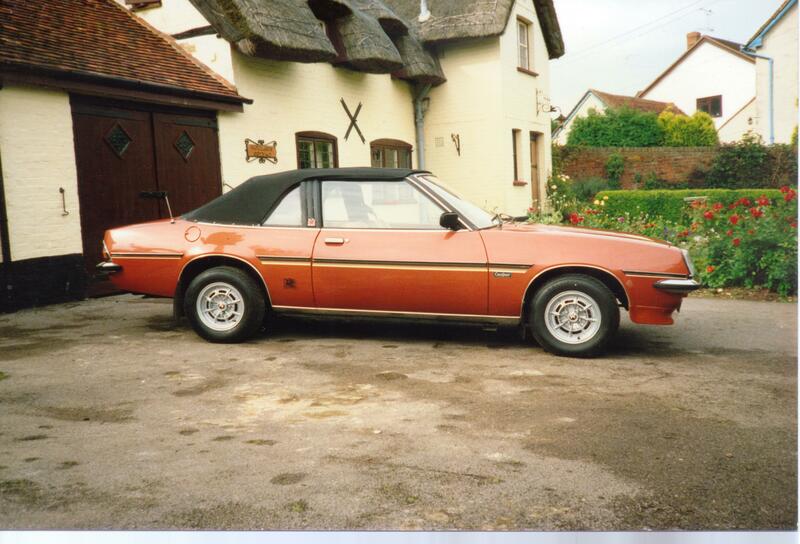 Are you planning on putting it back to a 2.0 4 speed?, mine has had a 5 speed box fitted at some point but I've managed to get hold of a good 4 cog box and center console to change it back, I'll be swapping it back when I finally get the albatross of a Scimitar back together. this belongs to an elderly couple who live in the south Beds area, they are classic vehical 'nuts', They are primarily into Hillman/Sunbeam Minx, Rapier etc but they also have a Bedford coach, A Pontiac Sunbird ( built on a Cavalier MK 3 platform with five stud hubs and a turbo 2.0L eight valve, its the Pontiac Firebird that has the screaming chicken on the bonnet ! ) 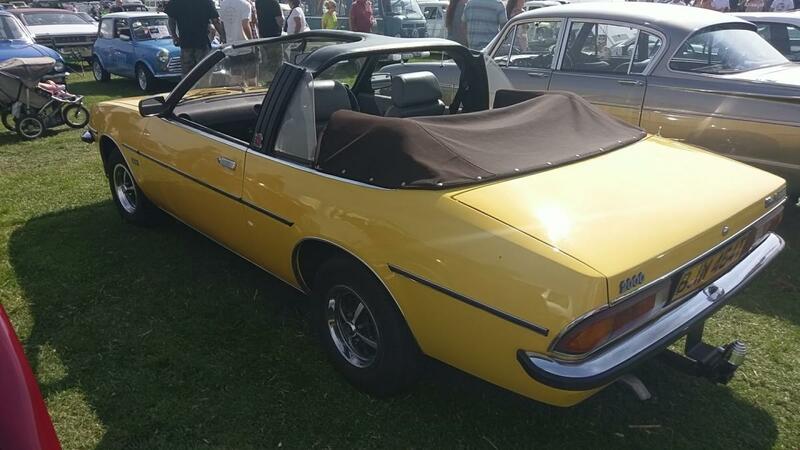 and this Centaur which as well as the quad lamps has a fuel injected 2.4L CIH engine and 5 speed gearbox, modifications to make it a competant grand tourer as it is frequently used on motoring holidays in Europe. Your welcome to use this photo if it helps you. Do you know if the owners do the internet ?, if so could you pass my details on ? That picture was taken by me at a new year meet at The Grovebury Lock Pub south of Leighton Buzzard perhaps 15 years ago, it was posted onto this website back then, amazing how Google found it. I haven't seen this Centaur since then, it was with the White triumph TR 2 behind it which i don't recall seeing around local either, i will make some enquires in the local clasic car circles, though the owners would be very old by now and might not own these cars anymore, but being in such good condition the Centaur will still be living on somewhere. Can you remember the reg number ? I would have to go back into my old laptop and see what I can dig up. haven't got into laptop yet, when I do, will see if I can find the email trail with the guys details. Condition of it wasn't that bad, certainly restorable whilst in my possession. If it's still where I left it for the guy, then I suspect it will be completely buggered by now!